We're constantly working on new kits in various scales. This page contains details of the kits we currently have scheduled for release, with as much information as we can give you at this stage. Click on any of the images below to display a full-screen (i.e. 640 pixel wide) version. LIMITED RUN OF On30 MOTORISING KITS TO TURN A RIO FIAT OMNIBUS INTO A POWERED RAILBUS. ONLY THE RESERVED NUMBER OF KITS WILL BE PRODUCED. This is NOT a kit which will be stocked in our range. Do not miss out.This exciting On30 project is rapidly progressing through the workshop. Photos show my under construction model. Check out how the motorised chassis fits. Features 6-wheel current collection via LIVE and INSULATED wheels. Drive is via a quality Mashima 1015 can-type motor and double reduction gearing, ensuring smooth performance down to a crawl. Simple fold-up chassis design in photo-etched brass. Spoked driving wheels included. NOT the solid disc type pictured. Detail castings in resin and lost wax brass. Seated driver figure provided. Motorising kit will include all parts pictured and more - leaving purchasers to source their own diecast 1/43 scale Rio Fiat Omnibus. It's also worth mentioning the motorising kit will fit the Rio Fiat truck model which features the same underframe. We're building one of those too - as an On30 Track Maintenance Railtruck. Notification of this project has already been posted on two Yahoo On30 forums and the reservations are already stacking-up nicely. Want one? E-mail us with your reservation, pronto and we'll be happy to add your name to the list. We wish to make it perfectly clear that only the number of reserved kits will be produced - plus only a handful extra - so if you see one of these kits in your future, don't procrastinate and lose out. When they're done, that's it. PRICE AND RELEASE DATE TO BE CONFIRMED SOON. We've been asked umpteen times for a ballpark price (which we'll not be held to ) so our 'guesstimate' is around the UK£60-UK£70 (depending on final spec.) plus shipping. COMING VERY SOON: Pre-orders gladly accepted. New O-9 (On18) GAS-MECHANICAL kit. Following on from, and spurred-on by the success of our recently released O-9 DIESEL kit, this new project is once again designed to fit a KATO 11-103 0-4-0 donor mechanism. Note: we will only be selling the kit completewith the required KATO mechanism. Comprising high quality pro-moulded resinparts designed for simple adhesive assembly using thin-type superglue. Novice builders will find these kits a cinch and experts will appreciate the level of detail. Kit includes everything including the driver figure. We decided it would be a good idea to also include the same overall corrugated roof from our earlier O-9 DIESEL to help establish the 'family' house style. To help provide the modeller with options, the overall roof may be easily cut-down to provide a short roof over the cab area only. Oh, and it's worth pointing out the void inside the model's hood will easily accommodate a DCC decoder. The O-9 GAS-MECHANICAL will cost £36. The KATO 11-103 mech costs £19. UK postage and packing costs £4. Overseas airmail costs £8. Well...customers keep asking if we'll make O-9 rolling stock for our O-9 locos to haul, so there are currently SEVEN different O-9 wagon kits in preparation. Think similar wagons to our On30 SELECT-a-CARs but only smaller! We've posted a photo showing the basic Flat Wagon - and mostly the rest of the wagons have been designed to use this same basic underframe - with the exception of the side-tippers. From the outset our O-9 wagons were designed to accept N-scale coupler standards so they feature compatible coupler heights to our O-9 locos. Not much point otherwise... We fitted Microtrains N-scale knuckle type couplers to our O-9 locos and wagons but any similar couplers will work. Our O-9 wagons feature a cast metal mainframe for low-down weight and to help them track properly. Bodies and sideframes are pro-moulded resin. You want fine details? Even wood grain and nail holes are all present and correct... The seven different wagons currently underway (with hopefully more to follow) comprise the following types: FLAT WAGON, STAKE WAGON, BULKHEAD WAGON, OPEN WAGON, TANK WAGON, Pair of BOLSTER (or LOG) WAGONS, SIDE TIPPER WAGON. Like our On30 SELECT-a-CARs, minimum order will be 3 x Wagons. These can comprise three of the same wagons or three different ones. Price and release date TBA. 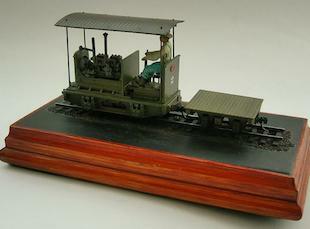 O-9 COMPRESSED AIR LOCO kit. Patterns for this kit are done. Just waiting for news of the 9mm diameter driving wheels which are currently being manufactured. Comprises bespoke etched chassis with Mashima motor and double reduction gearing for smooth, slow running. Includes etched, pre-rolled pressure tank with high quality pro-moulded resin details. Price and release date TBA.